Every year a select group of students in the Mechanical Engineering program in the A. James Clark School of Engineering at University of Maryland in College Park, MD compete in the Formula SAE (Society of Automotive Engineers) competition. The FSAE competition requires the team of students to design, build, and race their own open cockpit race car. The University of Maryland team, called Terps Racing, consistently finishes in the top 10 against 80 to 120 other school programs annually. Aiming for a 1st place finish in the upcoming races, the team is experimenting with a new engine design. The small autocross cars, usually weighing between 300 and 500 pounds, typically run on modified motorcycle engines. But Terps Racing is experimenting with using a snowmobile engine for the upcoming 2011 races. During the design phase for a new gearbox for this style engine, the students realized they needed a 3D CAD model of their snowmobile engine so that they could accurately design within the tight tolerances necessary to the mounting points. Terps Racing approached Direct Dimensions for help with creating a dimensionally accurate 3D model of the engine to aid in their design and we were happy to help! Step 1) Using a combination of FARO's portable CMM arm and laser scanner, Direct Dimensions' engineer Michael Lent digitized the important geometric interface features on the engine. 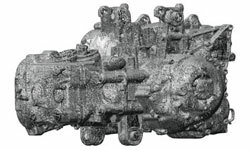 He then captured the complex casting shape with an attached laser line probe. The FARO system was a great fit for this project because it provides both a contact probe for high accuracy geometric features and a non-contact laser scanner for the complex contoured surfaces. Step 2) By utilizing a variety of software, including PolyWorks, Geomagic, Rapidform and SolidWorks, the Direct Dimensions engineers quickly merged and modeled the 3D digitized data with the laser scanned 'point clouds' into a hybrid of a parametric solid-based feature model with the watertight complex NURBS surfaces. 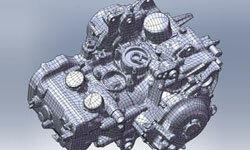 This file is readily usable within CAD software, such as SolidWorks for the re-design effort. Step 3) This final hybrid model, which offered both the exact representation of the mounting interfaces as well as the accurate contoured cast surfaces will be used by Terps Racing to design their 2011 car. 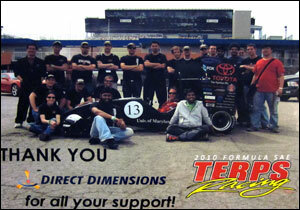 Turns out this isn't the first time Direct Dimensions helped a race car team at the U of MD. One of the first projects ever performed by the DDI engineers back in 1995 involved the use of the FARO Arm to align the wheels of the U of MD solar car prior to a critical race. How fitting to come full circle with U of MD with this new project. Good Luck Terps Racing in the 2011 races!